Mr. Verb: Public Authority, R.I.P.? Despite our recent silence, Team Verb is alive and well and mostly not even living underground here in Fitzwalkerstan. But we've been busy little badgers. * The current fight has been over the New Badger Partnership, originally a call for 'flexibility' for UW-Madison and now a proposal to make us a 'public authority', i.e. take a huge step toward privatization. This has deeply divided campus. It looks like the issue may be resolving itself in the legislature, with passage of public authority status now becoming unlikely. He also said while he agrees with the guv’s vision of giving UW-Madison more flexibility, proposing the spin off was too much for lawmakers to digest in one budget cycle. “I am positive that we are going to give some additional flexibility, but probably not all the way to allowing Madison to spin off and set its own tuition and all those things without more oversight,” he said on the show, which is produced in conjunction with WisPolitics.com. And we'll be back to language very soon. Promise. UPDATE, 12:00: A reader passed along this link about the honey badger (probably PG-13 or something in terms of language, but) hilarious. See the comments about why the honey badger rather than an actual badger is pictured here. 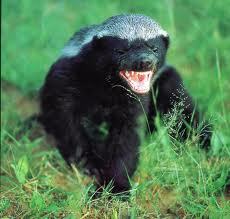 And oh yeah, do NOT mess with a honey badger. *A favorite slogan here is that Walker is "a weasel not a badger", along with lots of references to what badgers do when attacked or cornered. As you can read here, the little critters are said to be able to fight off bears and wolves. The Wisconsin State Journal had two pieces of interest on this topic on Sunday. The first was a front page piece on Chancellor Martin and the lack of support she is receiving. The second was a follow up op-ed with the two points: first, choose your poison and Walker's poison is better than Nass'; and second, if everyone else is doing the jitterbug so should we. I found the article broader in its scope and less sympathetic than the op-ed pieces. Surely there will be more, although I suspect from the Journal closer to lake Michigan than the Journal closer to lake Monona because the former is more conservative than the latter. Chalk this up to Odd Wisconsin. So, what does Biddy do now? Staked everything on this and it's now failing. Wow, when the co-chair of JFC says this, that means something. Can we turn our attention now to thinking about specific flexibilities? Maybe have an actual study of how best to do that? OK, folks, enough with the questions about the image: It's a 'honey badger', which is actually not a badger. Badgers are related to weasels, and this creature is more weasel than badger, despite the name and looks. With the whole thing about 'badger not weasel', etc., it's sometimes not obvious on seeing one which is which. Did the visual joke fail that miserably?